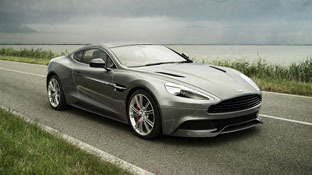 Welcome back… Aston Martin brings back their flagship Vanquish in 2013, starting at $280,000 USD with a 573hp 6 liter V-12 and a 0-60mph in 4 seconds simply know as the AM 310 Vanquish. The body is made of carbon fiber over an aluminum chassis and endless technology to keep it on the road. A new larger interior and trunk and an optional 2+2 back seat, but who want to sit back there?? ?